Few groups speak more loudly in debates over the reallocation of street space than local businesses. In New York, there are merchants who vocally favor a better environment for pedestrians, cyclists, and transit, but all it takes are a few firm believers in easy car access to dictate the terms of the public debate. Case in point: In 2009, merchants in Greenwich Village and along Grand Street were able to get mayoral candidate Bill Thompson on the record against bike lanes. But businesses aren’t transportation planners. In fact, they usually get basic information about their customers’ travel habits wrong. New evidence from an important study of separated bike lanes in downtown Vancouver [PDF] shows just how mistaken they can be. Last year, Vancouver built two physically separated bike lanes in the heart of its downtown, along Dunsmuir and Hornby Streets. As is so often the case, area businesses worried that the lanes would harm their bottom line. In response, the city joined with three downtown business associations, hired a team of consultants and set up what it hoped would be a high-quality investigation of the effect of the bike lanes on business. What the consultants found, though, is that merchants’ perceptions can be deeply flawed. The errors cropped up on almost everything about which the businessmen were surveyed. Tenants on the upper floors of buildings facing the bike lanes estimated that they slowed motor vehicle traffic by an average of 5 minutes. City data show the change in travel times ranged between a reduction of five seconds and an increase of one minute, 37 seconds. Retailers didn’t even know how customers were getting to their own stores. They estimated that 40 percent had driven there; interviews of actual customers showed the true total to be half as much. Twice as many customers cycled to the stores as businesses believed, and while the merchants guessed that a quarter of customers rode transit, 42 percent actually did. From Streetsblog’s vantage point in New York, we can’t comment on the quality of these particular Vancouver lanes — for that, head over to Spacing Vancouver for a great evidence-based summary — but what the study shows about business’s understanding of their customer base is important and reinforces similar research performed in New York and other cities. 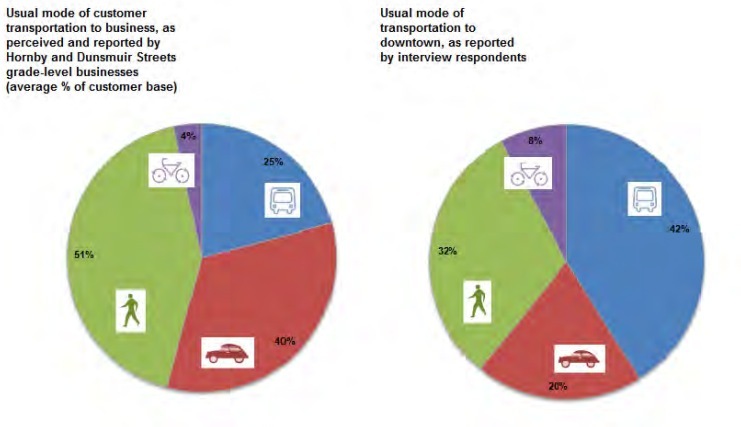 In Toronto, a 2008 study of Bloor Street [PDF] found that only 10 percent of customers arrived by car, and that those who biked or walked came more frequently and spent more money than driving customers. Here in NYC, whenever researchers talk to actual customers, rather than those imagined by merchants, the results are striking. In SoHo, where Sean Sweeney fights to preserve every last inch of asphalt, only nine percent of Prince Street shoppers arrived by car. This May, DOT found that only four, six, and eight percent of shoppers had driven to shopping areas in Union Square, Jackson Heights and along Fordham Road, respectively. Even on Staten Island, less than two-fifths of people had driven to New Dorp; that’s not what you’d think if you only heard from the area’s business owners and elected officials. Merchants should be part of a community planning process around transportation policy. But until they stop bringing misguided assumptions to the table and presenting them as fact, politicians and the press need to learn from the research in cities like New York, Vancouver, and Toronto and lend a little less credence to their claims. The pie on the left adds up to 120% and the one on the right adds up to 102% – what gives? I blame it on the metric system. The real answer is below the pie. The extra 20% are the customers who merchants believed arrived at their stores via jetpack. Ah – I jumped straight into the article after looking at the image skipping the caption – thanks! Perhaps bike lane hysteria is caused by some innate biological evolutionary factor. Human beings are, essentially, pack animals. We’re very territorial. Perhaps we see the reallocation of public space as a threat, an encroachment on our territory by some other tribe: The Cyclists. changed annually in the past three years? factors had on your sales in the past year? Note that the total is -31%, as opposed to the -5% claimed in the /question immediately before that/. They didn’t even bother to make “Other” a positive to line them up. I’m not sure how to interpret this data. Did the global economic downturn have less negative effect on business than bike lanes, or was it in fact caused by bike lanes?